The Future of Sports Broadcasting? … and, with two of my boys very keen hockey players, we watched a little bit of the action. As I was watching, I was struck by the fact that this is the future of sports broadcasting. The live video wasn’t perfect – the speed of the game was a little too much for our Internet connection – and, at times, you had to piece together the action; but how often do you get to see a live broadcast of a hockey international outside of the Olympics? Hockey is one of those sports that has a very strong base across Australia and very successful national teams, but without the commercial appeal of codes like cricket or AFL. As a result, the game struggles for broadcast airtime, even on pay television. When you consider the limited broadcast opportunities for sports like hockey, it makes perfect sense for the game’s administrators to reach directly to their audience via the Internet. 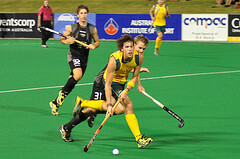 After all, what’s the main purpose of an organisation like Hockey Australia? However, I don’t think this style of broadcasting is limited to what some might call ‘fringe’ sports. You only need to look at Channel 9’s treatment of the pool games in the Rugby World Cup, currently being held in New Zealand. While Channel 9 purchased the broadcast rights to the World Cup, some pundits have argued that the network did so for purely defensive reasons – to protect its audience for the Australian NRL (rugby league) finals series. See the report on ABC’s Media Watch: http://www.abc.net.au/mediawatch/transcripts/s3336392.htm. Australia’s peak body for rugby union (the ARU) may have received a good financial outcome by sharing in the proceeds from the sale of the broadcast rights for the World Cup, but it’s not ideal that the games being played are either not broadcast at all, not promoted by Channel 9, or are delayed in deference to the NRL games. Then, when Channel 9 did show a live game – such as the Wallabies vs All Blacks semifinal last night – why did the commentary make me feel like I was watching a horse race? After all, for most sports, the mandate for their governing bodies is to encourage grassroots participation and increase the popularity of their code. And what better way to do that than by providing direct access to the Australian public to watch the game being played at its highest level – an international game. Watching the men’s national hockey team (the Kookaburras) in action in the Oceania Cup against New Zealand might not have been perfect but, with the improvements in bandwidth that will come with the rollout of the NBN, watching a live broadcast of a sporting event – no matter how ‘fringe’ – will become commonplace.